This doll is a museum quality replica of a Corinthian style doll. 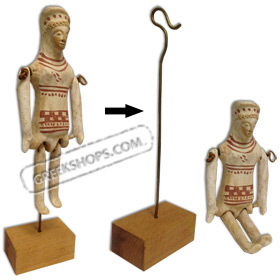 These dolls also called "nevrospasta" because of the jointed hands and legs, and were the first ancient Greek dolls to take human form. They are typically "naked" so that children can dress them. The original dolls are dating back to the third century BC. This particular doll was found near Athens and is believed to be an Athenian reproduction and improvement of the Corinthian doll design. This fine museum quality replica is a unique "one of a kind" ceramic reproduction made from clay originating from the same fields where the original was found to ensure the same "look and feel" as the actual piece. All paint decorations were also made replicating methods used by potters of the particular period. This is why this item is hard to distinguish from the original and requires the attached traditional lead stamp (shown as part of the description tag) that identifies it as a reproduction made by an auathorized artist. Like the actual museum displays each piece is tagged with its description. Shipped with decorative stand as shown in the picture.